Visiting Santorini has definitely been on my bucket list for photographing a wedding so I was hugely excited when Roxy and James, who I had met an another wedding in Tuscany got in touch to tell me about their plans. 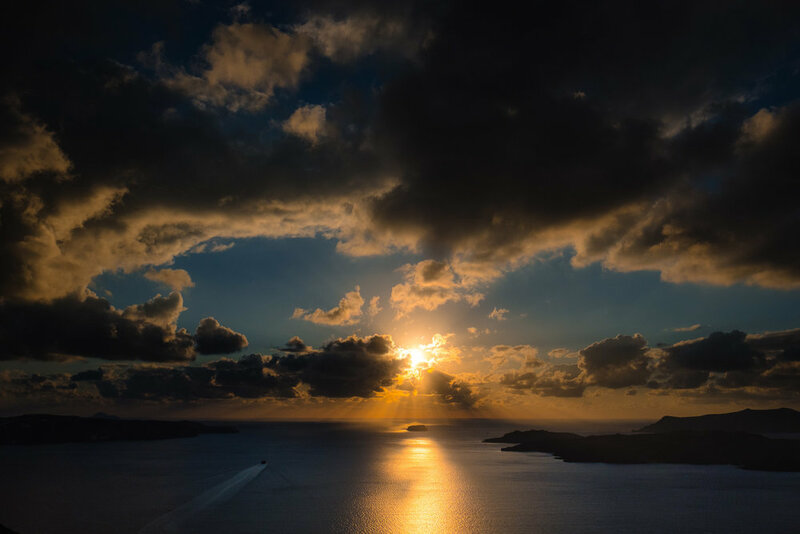 I tend to just fly in and out of places and on to the next thing at this time of year but I decided to extend my stay to be able to see a little more of the island as I doubted I would be back unless for another wedding. End of September is getting towards the close of the season out there which means less people (although it still felt pretty crowded) and more changeable weather. I prefer it a bit cooler so it suited me to be exploring away from the scorching summer heat but it did mean that the wedding day was a little cloudy and so the backdrops were not really the picture postcard azure seas but a rather more gentle hazy light. I’m going to blog about the wedding more soon but I just thought I would share some of my tips from my vast knowledge having spent three days out here! Caldera views and Cape Akrotiri lighthouse - with a 3am wake up for my flight I arrived tired in Santorini early afternoon. I intended to have a nap but once I got behind the wheel I just kept driving. I loved the sense of freedom that being on a small island gave me to explore - and the fact that you can literally see from end to end and across it’s breadth at most points. I headed south to the more scrubby and sparsely populated end of the island. The views over the bay looked towards the Southern tips with the towns dotted along the peaks of the cliffs. At the end i found a light house and many couples (this was to be a common theme every where I went). As I headed back towards Fira I stopped off at Good Heart Tavern, one of the many tavernas strung along that road for some late lunch overlooking the sea. Ammoudi Bay - I drove the car to the furthest tip I could find and that led me down on to Ammoudi which sits at the bottom of a steep cliff atop which perches Oia which is literally breathtaking. When I first arrived on the island I was puzzled by the white tipped cliffs - snow?! - but then I realised that it was the stretches of white houses along the key coastal points. 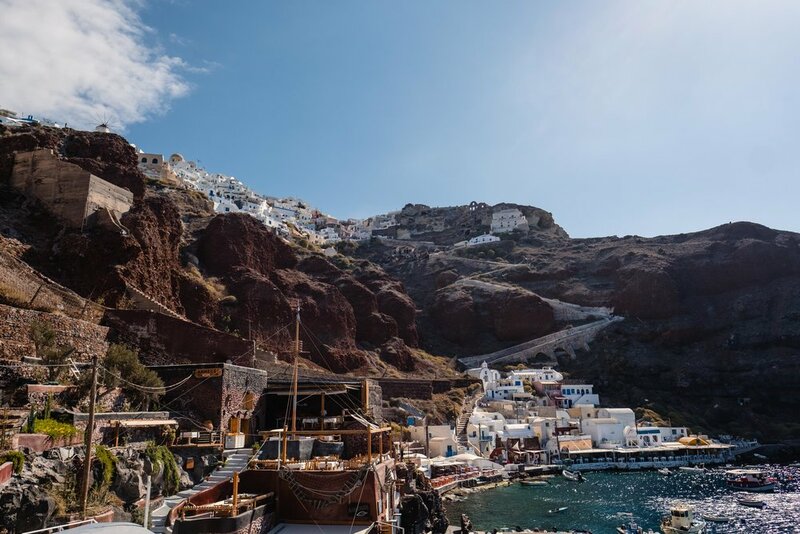 There are lots of great seafood restaurants on that bay and I then walked, along with some horses, the 200 odd steps up the cliff and into Oia where I sat and had my Greek salad perched high up over the bay. 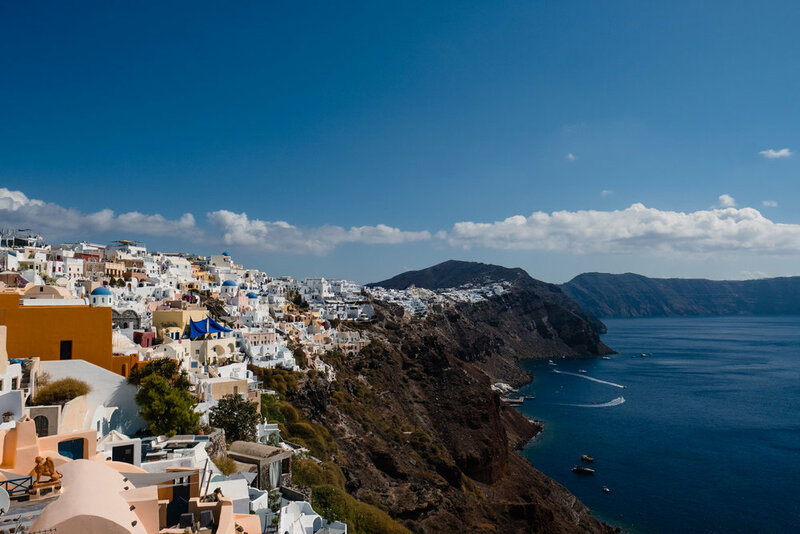 Oia was uncomfortably full of tourists but it was a must see to get a sense of the architecture of the towns which cling vertiginously to the edges of the cliff, gleaming white and interspersed with with it’s signature blue of church roofs and pools. Not for the faint hearted. I did have a twinge of envy seeing tourists lolling in their private pools with a pretty epic view - although not so private. Perivolas Beach - the beaches in Santorini are mainly pebbly or volcanic sand so don’t expect stretches of golden shores. Quieter than Kamari beach was Perivolas Beach further south around the coast. You can sit for free on the loungers or eat lunch in many of the great restaurants. I had a delicious crab salad (for 2) at Sea shore? My final stop before the airport was breakfast (chip and feta omelette - better than it sounds!) at the south end of Kamari beach. It’s a bustling little town and the beaches tend to fill up quickly on the free sun loungers. After three days I felt really connected to the island and it’s features familiar to me. I loved the simplicity of it, the spectacular views at every turn. And there is nothing like travelling alone to really stretch your curiosity legs. I’m glad I’ve had a chance and hope I get to a chance to return.